Bio: Salvatore Carrozzo was born 1941 in Alezio in the province of Lecce in the Apulia region of southern Italy, only 4 kilometres inland from Gallipoli. Carrozzo moved to Naples, where he graduated in law. He ia a self-taught painter, who has participated in numerous group exhibitions in Italy. From 1980 up to the present he has held a solo exhibition annually. Gallery: There are only 7 pastels in the gallery. The focus is on oil paintings. Image View: The thumbnails open in a slideshow format and you navigate this by forward (avanti) and back (indietro) arrows. You will need to view the source code and play with the HTML to download an image. I have explained how this is done in a previous post. Here is a clue. Just vary the past02 bit from past01 thru past07. 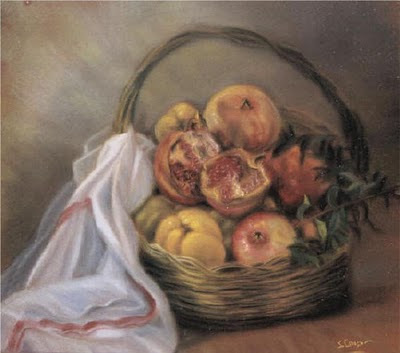 Basket of fruit is 70x60 cm, 560x500, 39 KB.